For many homeowners, there is no substitute for a beautiful hardwood floor. Wood flooring is longer-lasting than laminate floors and has the authenticity of being made of natural materials. Nothing about the texture or design of wood flooring is manufactured. Hardwood floors bring elegance to any room and this makes them highly sought after. The right wooden floor can significantly increase the resale value of your home. Since 1996 Buckingham Flooring has been helping homeowners beautify their homes with our magnificent selection of wooden flooring products. Hardwood flooring is an incredibly lasting flooring option. Homes that are over 100 years old still have their original hardwood flooring. Hardwood floors rarely need replacing as long as they are properly cared for with regular cleaning and occasional refinishing. Natural hardwood floors will often last the rest of your life. When it comes to hardwood flooring there are two main options available to you – natural wood flooring and engineered wooden flooring. Natural wood flooring exuberates warmth and beauty to any room in your home or business. We at Buckingham Flooring genuinely believe that nothing compares to the natural colours and textures of solid wood flooring with its wide breadth of colours and sizes. Being natural, the product breathes and changes naturally with age bringing life and colour to each and every room. Engineered wood is also made 100% real wood, but the main difference is the way in which it is constructed and behaviour. Engineered wood flooring is easier to install tend to be cheaper to buy. When deciding what option to choose, it is important to look at the room purpose, family behaviour and the performance qualities required. The type of wood, the species, the colour and the way in which the flooring is produced will help you choose the flooring that is right for you. We at Buckingham Flooring provide over 20 years of experience and impartial advice. If you are thinking about hardwood flooring come and talk to the experts. Solid hardwood floors are just that – they’re made from solid wood. Each board of solid hardwood flooring is made from a single piece of hardwood that’s about 3/4 of an inch thick. Because it’s so thick, it can be sanded down and refinished for however long the flooring is in the house. Engineered hardwood is a versatile and resilient flooring option that can be installed in most areas of your home. Made of genuine wood, this flooring gives your home and updated look and feel. Engineered hardwood is made of a core of hardwood or plywood with a layer of hardwood veneer affixed to the top surface. It’s more resistant to moisture and head compared to solid hardwood. Where Can I Install Hardwood Floors? 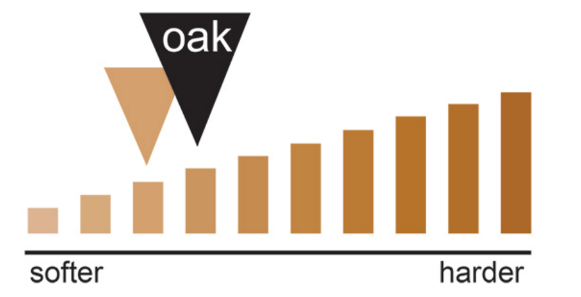 The unique construction of engineered wood creates a structure that is less likely to buckle, gap, or react to fluctuations in humidity and temperature. You can install engineered flooring on any level, including below ground. It’s a great choice for finished basements and bathrooms. Both solid and engineered hardwood floors are designed for beauty and durability. Their tough surface can stand up to active homes. However, both solid and engineered hardwood flooring have different performance attributes. Solid wood flooring is permanently nailed to the subfloor. Because of expansion and contraction issues, installers will normally leave a gap between the wall and the floor to accommodate swelling. This type of flooring should only be installed in parts of the home above grade and only over plywood, wood or oriented strand board subfloors. Engineered floors have enhanced stability, which provides slightly more resistance to everyday wear-and-tear and also to buckling or rippling. Solid hardwood floors are more prone to shrinking or expanding based on humidity levels. Engineered wood floors can be more resistant to moisture and offer a bit more stability than solid hardwood. 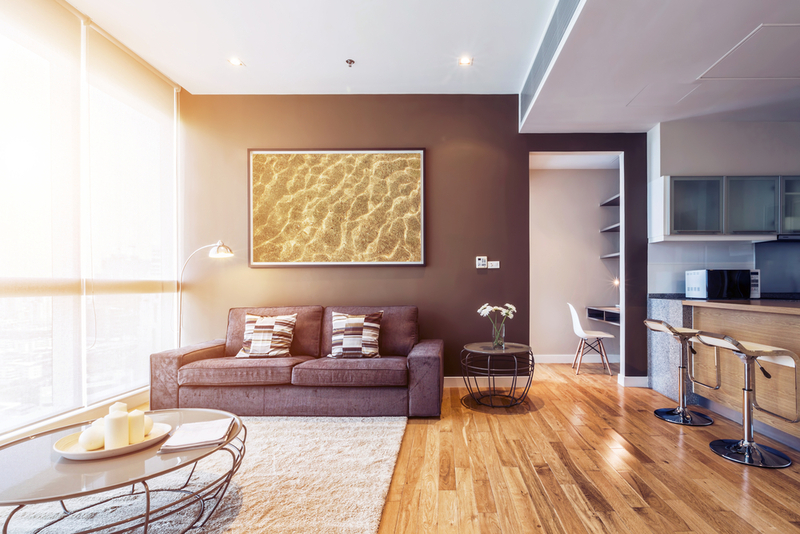 While no wood product can tolerate water laying on it, the increased moisture levels over concrete aren’t a problem for most engineered wood floors. 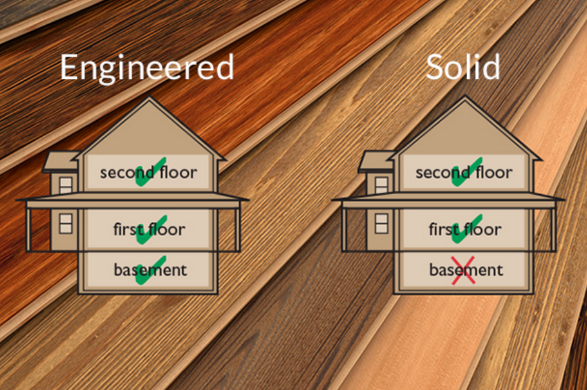 Unlike solid hardwood, engineered hardwood can go over concrete under the right conditions. © 2017 Digital NRG Ltd. All rights reserved.